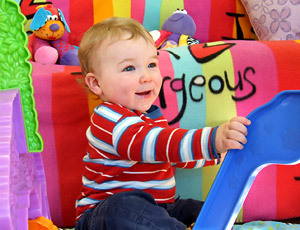 The Shankill nursery is a bright, secure, self contained warm and stimulating environment for babies aged 3-14 months. It is filled with age-appropriate toys, stimuli and activities designed to meet all developmental needs; - physical, intellectual, emotional and social. Our babies also enjoy getting out in the fresh air, they can enjoy walks in the buggy to the local park or around the local area. Discoveries managers and staff members are qualified to meet all your baby's needs, and their gentle nature supports and maintains a nurturing environment. Our settling in week - which we offer free to all parents - allows us to get to know the unique qualities, likes and needs of both parent and child. On collecting your child you will receive a written report containing information about bottles, meals, nappies etc, as well as a comment about what your child's day was like. Our aim is to roll in behind the parents in the morning and then to provide all the information about the day in order to support the child's routine at home that evening. Our Shankill Nursery caters for 9 babies. Do you have cover for lunch breaks and holidays?